Get More information on the requirements to get your permit or license. Check out resources list the information on all aspects of Colorado driving laws. Click Here to access our Online School. Six hours of behind-the-wheel driving(BTW) for those students who obtain their permit between the ages of 15 years and 15 years, 6 months and those needing an insurance discount. . I do four, hour and a half sessions with the student. The cost for the six hours of driving is $300. Students can opt out of this if they wait until they are 16 years and 6 months old or older or if they live more than 30 miles away from my teaching location. Also you will be required to do an additional 12 hours of driving with a parent/guardian for a total of 62 hours. Personal driving instruction and/or private lessons and evaluations cost $75 for an hour and a half. We also offer the written learner's permit test in English or Spanish for $20 per test. Payment is cash only. The 30-hour driver education course is available online from this site-$100. This does not include the 6 hours of driving with an instructor, which would be an additional $300. Driver tests as required by the state for the license is $45 for the general public, $35 for my students. This is for all tests. The fifth test has to be scheduled at the DMV. Please note that the DMV will not process your license after 4:00pm. You will need to wait until the next day. 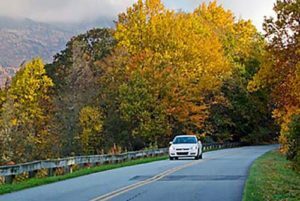 The drive test can be conducted in my vehicle with a fee of $60 or in your vehicle for $45. If you are required by the state of Colorado to have an interlock installed in your vehicle because of a DUI, we are required by law to use your vehicle. To use your vehicle, you must have current registration and insurance and if registered in Colorado you must have both front and back license plates on your vehicle. If these are out of date and/or you do not have these items, then we cannot use your vehicle until you comply with the law. Also, we have to conduct safety checks on the vehicle where we check your brake lights, turn signals and cracks in the windshield. If one of your brake lights or signals does not work and/or there is a crack in the windshield that impedes your vision, then we cannot use your vehicle until you repair those issues. In order to make an appointment, you must call 970-749-6361. You must log on to https://mydmv.colorado.gov and preregister. How do I get a Colorado learners permit? You need to be at least 15 years of age to earn your permit, and you must be at least 14 years and 6 months old to take drivers ed. 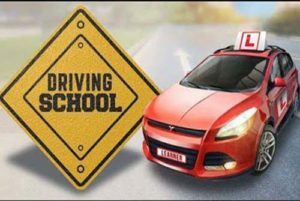 If you meet the age requirement, you’ll need do the following: complete an Affidavit of Liability and Guardianship (Form DR2460) and complete a Colorado DMV-approved driver’s education/driver awareness permit course. Need to to complete a 30 hour driver education course (classroom, internet, home study). Note: This class can be taken as early as 14 years and 6 months. 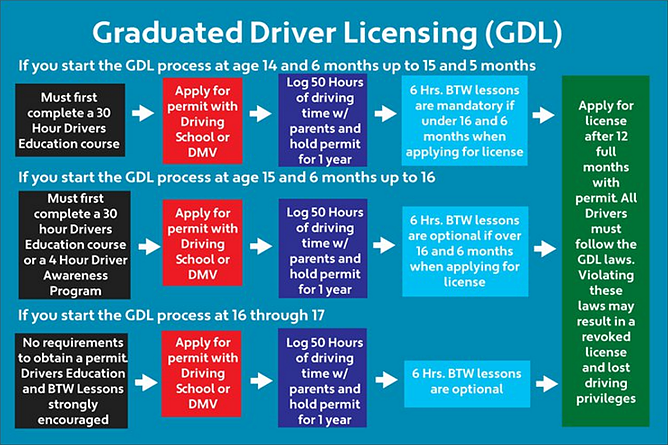 Once the student completes the 30 hour class he/she has to wait until his/her 15th birthday in order to get the actual learner’s permit. Need to take and pass (80% or better) a written test that can be done at the DMV or through Pagosa Driving School. a. 4-hour driver awareness program. Note: Student must be 15 years, 6 months from the day of class in order to take class. 30 hour driver education course (classroom, internet, home study). Need to take and pass (80% or better) written test that can be done at the DMV or through Pagosa Driving School. Must hold the instruction permit for a full 12 months. Log 50 hours of driving with a parent/guardian on the log sheet https://www.colorado.gov/pacific/sites/default/files/DR2324.pdf (10 hours need to be done at night). 6 hours of behind-the-wheel training is required with a professional driving instructor up to 16 years and 6 months, unless the person lives over 30 miles from a full-time driver education school. BTW is not required on or after 16 years and 6 months. If you believe you are outside the 30 mile radius for BTW, then you will need to submit to the DMV a MapQuest or Google Map from the address on your permit to 641 Midiron Ave. Pagosa Springs, Colorado 81147. Need to take and pass a driving test that can be done at the DMV or through Pagosa Driving School. Must hold the instruction permit for a full 12 months or until 18 years old, whichever comes first. Log 50 hours of driving with a parent/guardian on the log sheet (10 hours need to be done at night). Must obtain or have an instruction permit. How does the online Drivers Ed course work? Our online https://pagosadriving.costechonline.com/ program is a state-mandated 30 hours long. 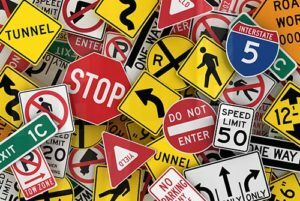 The information in our course is separated into 10 Modules, each covering a specific topic regarding driving in Colorado. Once you complete each chapter, you’ll be given a multiple-choice quiz. You’ll need to pass each chapter quiz with a score of 80% or greater; if you don’t get this score after two attempts you’ll need to review the chapter before moving on. At the end of the course, you’ll be given a final exam. If you pass the final with a score of 80% or greater, you’ll complete the course. You will have unlimited attempts to retake the final should you not achieve a score of 80%, but after the second attempt, you’ll be required to review the entire course (at no additional charge) before any additional attempts. There are a few ways you can make your payment online: by using a credit card, bank debit card with a Visa/MasterCard/Amex/Discover logo or Paypal.